Update On Celebrity Chef Gaston's New Upscale San Francisco Restaurant - La Mar! Here is an update on the arrival of Peruvian celebrity chef Gaston in the United States. He will enter the U.S. market for the first time with his seafood trademarked and branded Peruvian restaurant called "La Mar" (The Sea). This San Francisco restaurant will be his 10th La Mar establishment in the Americas. He will open his 9th in Santiago, Chile on August 26, 2008. At the end of the year in London, England; he will open his other successful upmarket Peruvian Cuisine brand "Astrid y Gaston". Gaston is by far the #1 Latin American celebrity chef in the Americas and among the most successful upscale cuisine restaurateur in the world. The San Francisco La Mar establishment will be the entry point and flagship restaurant in the U.S., and it will also be the catalysts to open the Manhattan-New York, Miami, Chicago, San Diego, Los Angeles, and Las Vegas markets in 2009 and 2010 with the La Mar Peruvian seafood brand. Within this time-frame, Gaston will also introduce in the United States his "Astrid y Gaston " Peruvian restaurant brand (named after his pastry chef wife Astrid). The San Francisco La Mar restaurant, which is tentative to open this Fall 2008, will be Gaston's 30th upscale Peruvian restaurant in Americas and Europe. In the last 5 years, Gaston's culinary empire has surpassed the successes of the more famous celebrity chef/restaurateur in the U.S., such as Wolfgang Puck, Gordon Ramsay, Nobu Matsuhisa, and Anthony Bourdain. But what is even more remarkable about Gaston's accomplishments is that he is not known (yet) in U.S. or has yet to open any kind of restaurant here! All his successes have been aboard. The entire country of Peru wants him to succeed enormously in the United States. He is the face & brand of the new Peru - young, modern, worldly, educated, hard working, charismatic & successful. At the Fourth International Summit of Gastronomy Madrid Fusion 2006 (the World Cup of executive chef competition), regarded as the world's most important gastronomic forum, held in Spain; Lima, Peru was declared the "Gastronomic Capital of the Americas". At this Madrid Fusion 2006 Summit, Gaston's team of executive chefs beat all comers all the way to the grand final against the French team. Since the Spanish judges were not too familiar with Peruvian Cuisine, they declared the French team the winner at the summit and the Peruvian team runner up as the best international cuisine in the world. Currently Gaston is the leader of among an army of 1000's of young Peruvian executive chefs and restaurateur being trained in Peru with a long term 20 - 25 year mission to make Peruvian Cuisine the #1 fine dining cuisine in the world, and make the original Peruvian Cebiche the #1 seafood on Earth. Since 2006 Lima, Peru has surpassed Paris, France as the culinary academy capital of the world. Lima has 37 institutes, academies, and Cordon Bleu certified culinary schools and institutes. Lima, Peru is the only city in all of Latin American with one of Paris' official Le Cordon Bleu academy with a 100% culinary program curriculum. Mexico City has a Le Cordon Bleu hotel management academy program, but not a culinary school. More photos, as of June 20, 2008, of the construction of the new upscale San Francisco seafood restaurant by Peruvian celebrity chef Gaston - La Mar! A massive inside and outside establishment that is 11,500 - 12,000 Sq. Ft!! La Mar has now set the standard for a restaurant since the Dot Com era with the highest lease ever paid in San Francisco!!! PS. 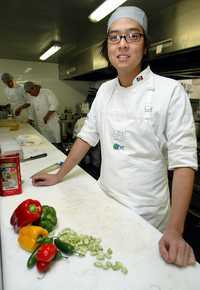 The #1 celebrity Sushi chef in the world Nobu Matsuhisa of Japan, famous Hollywood & London A-list celebrity chef to the stars, worked and lived in Lima, Peru for 4 years. That is where he learned how to make Cebiche, Tiraditos, and Mariscos with the Peruvian influence, style, and ingredients. He lived, worked, and had a successful Japanese-Peruvian restaurant in Lima back in the 70's. It was not fusion, it was a mixture of Japan & Peru. He always travels back to Peru to learn new creations, ingredients, and meet up with old friends. Global Internet Poll Declared "El Cebiche Peruano" As The Best Traditional Dish In The World! As many of you known from my previous posts about the introduction to the United States of Peruvian celebrity chef Gaston, and his much publicized grand opening in the food press of La Mar (The Sea) in Francisco this Fall. And the other post about how Peruvian Cebiche will dethroning Japanese Sushi. The fine dining and upper-end seafood establishment in San Francisco and the rest of the U.S. should take notice of the following news coming out of England and Spain. A recent 2-month world-wide internet poll concluded last Friday, August 15, 2008, by a major Spanish online newspaper "20 Minutos" in Madrid declared that the "Peruvian Cebiche" is the best traditional dish in the world! It received by huge margin, the most votes from their very knowledgeable and discriminating core food critics, their readers and users in Spain and abroad. Reports, video, and pictures of the winner in the links below in English and Spanish. Report from LP News by Israel J. Ruiz - July 16, 2008. After over 7 million people around the world choose their favorite flag through a Spanish news website, the site's users have organized a new contest: The Best Traditional Dish in the World. This competition is an unofficial one with no monetary reward and is not recognized by any special organization. Despite this, hundreds of thousands of Internet users take pride in selecting a traditional dish from their country in hopes that it will gain one of the top spots. With over 95,000 points, cebiche, Peru's most famous gastronomical dish, is currently ranked number 1. It is ahead of other international dishes such as tacos, pizza, sushi and paella. Since the contest began in late June, many dishes have been eliminated, leaving only 15 to choose from. Participants will have until July 28 to vote for their favorite dish. On this date, the three best dishes will be announced and voting will commence once again. Participants will then have until August 15 to choose The World's Best Traditional Dish. NOTICIERO - CEBICHE PERUANO EL MEJOR PLATO DEL MUNDO! El cebiche gano a los tacos y la pizza. "El cebiche peruano gano ayer en la votación final como el mejor plato típico del mundo, en la encuesta que se realizó en la página web del diario español '20 Minutos'. Ahora va primero en la competencia por la elección del potaje más delicioso del universo. Al popular plato peruano, que ha recibido un total de 280 mil 458 votos, le siguen en la lista los tacos mexicanos (93,524), la pizza italiana (71,943), el sushi japonés (55,689) y las pastas italianas (55,460). El asado argentino, la paella española y la hamburguesa americana, entre otros platos famosos en el mundo, habían quedado relegados de la final de la competencia. El cebiche lidera ahora la encuesta por el potaje más exquisito del mundo, seguido por la pizza." Final result on August 15, 2008 - World-wide internet poll Declared Peruvian Cebiche As The Best Traditional Dish In The World! PS. Peruvian Cebiche is not like Japanese Sushi - they are two completely different types of cuisine. The fish and the seafood in Cebiche is actually cooked by the acidic properties of the lime juice, regardless if the juice used is Peruvian Lime, Key Lime, Mexican Lime, or Chinese Lime. Eating Peruvian Cebiche is safer and healthier to consume compare to Japanese Sushi because the fish and seafood is not raw. The acidic properties of the lime juice will kill and destroy any bacteria or worms in the dish. There have been numerous reports in the news lately that eating completely raw fish and seafood (Sushi) may not be too healthy. As for me, as long as it is fresh, clean, and save; I'll still eat Japanese Sushi. But Peruvian Cebiche is better.....YUMMY!! !